Dinner time can be pretty tricky at our house sometimes. We have a lot of opinionated eaters. This meal is one that my family really enjoyed. The lemon provides such a fresh flavor and the sauce isn’t heavy tasting. It is light in consistency and compliments the heaviness of the pasta perfectly. My kids love the chicken! The herbs bring in additional delicious flavors and the whole meal works together wonderfully. This is definitely a recipe I will be making again! 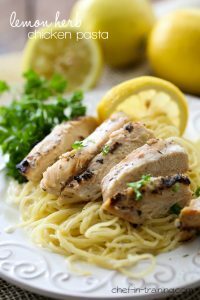 The Lemon Sauce is so refreshing and light in consistency and compliments the pasta and chicken wonderfully. Prepare and Grill Lemon Chicken according to directions. Set aside. Cook pasta according to directions and set aside. In a large sauce pan, heat olive oil. Add garlic and lemon zest to heated oil and saute for 1 minute. Add half and half, salt, and lemon juice, basil, and cook on medium heat until hot. Add paremsan cheese and pour over chicken and pasta and serve. half and half is half cream half milk and is found next to the heavy cream at the grocery store, or you can make your own if you can't find it using heavy cream and milk. My kids regularly ask for pasta and lemon chicken but I never thought to put them together! Lemon and chicken is such a good combo. Add pasta and Parmesan? Sign me up! I love how light this is, perfect for summer. Cracked me up when I read "opinionated eaters", so true here too! What a perfect family meal. I bet the lemon adds so much flavor! So you need a whole quart of half and half for the sauce? oh my goodness. Big typo. No its only 1 pint. So sorry about that. This has so many yummy flavores but I was disappointed in how runny the sauce is. Thinking I might add some mozerrella cheese to the leftovers.